It looked like a day for pajamas. Or at least sweats. Until I got a call from the farm stand saying they had a box of squash waiting for me- for cheap! Okay Bello, put some pants on, lets go. 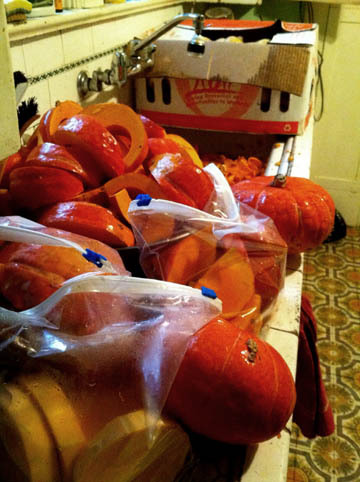 I picked up a 15lb box of butternut, 12 kobucha, and 7 acorn squashes plus 5 bunches of kale, 3 parsley, 6 onions, 2 celeriac roots and a bunch of beets. I have happily spent the last 5 hours prepping the squash for roasting and refrigerated storage. In the coming week I plan on making a squash gratin and a squash flan! And soup and baked wedges to be eaten with aioli. Everything with aioli!